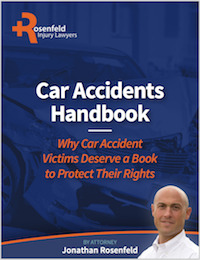 Our Car Accident Handbook: Why Car Accident Victims Deserve a Book to Protect Their Legal Rights provides information about your legal rights following an Illinois automobile accident. With decades of experience representing accident victims, our attorneys address many of the issues involved with Illinois car accident cases involving injuries or even death. We suggest that you read this book before you consider talking to an adjuster from the insurance company or select a lawyer to represent you. You will learn how these decisions can have a significant impact on the outcome of your case. This book will explain the laws that may impact your case and the steps you can take to maximize your financial recovery. Having successfully represented hundreds of people injured in car accidents, attorney Jonathan Rosenfeld shares his insights on how to maximize the full value of your case under Illinois law. This book sells for $17.95 plus postage and handling, but we will email it to you for free if you fill out the form below. Do You Need a Free Legal Evaluation of Your Illinois Car Accident Case? Of course, should you have additional questions about your legal rights and options following an Illinois car accident, we invite you to talk to one of our lawyers today for a free review of your case. All of our auto accident cases are handled on a contingency fee basis where there is never a fee charged unless we are successful in obtaining financial compensation for you. Put another way, you’ve got nothing to lose by contacting us. Name: (Required) Email: (Required) Phone: Address: Why Are You Requesting The Book?